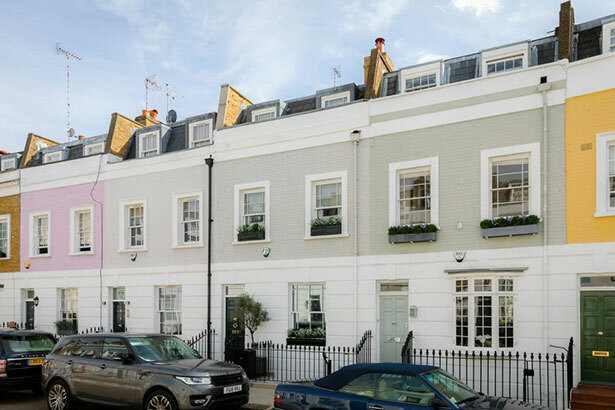 A Chelsea townhouse recently refurbished by super-prime developer Finchatton has hit the market at £5.65m. The 2,383 square foot mid-terrace on Smith Terrace was completely remodelled in 2014 by the firm behind some of PCL’s best-known luxury schemes, including Twenty Grosvenor Square in Mayfair, and The Lansbury and Kingwood in Knightsbridge. The “ingenious” overhaul saw a spiralling feature staircase installed in the middle of the period property to link all five floors, and bring natural light down through the space from a large skylight. A sizeable basement was added as part of the works – which would prove impossible these days under RBKC’s tightened-up planning regime – housing a media room with a 60” high definition wall-mounted television and 5.1 surround sound, which together deliver the “ultimate home cinema experience”. The rest of the accommodation includes three double bedroom suites, a dining room/study, a drawing room with “sumptuous” lounge furniture and full-width floor-to-ceiling windows, and a fully bespoke kitchen with Compaq Carrara Quartz worktops and French sliding doors leading directly onto a private garden. There’s also permission in place to add a high-tech retractable glass terrace off the drawing room, which would transform the existing outside space into a covered winter garden for year-round use – definitely worth thinking about anyway. The project also saw the whole place rewired and kitted out with the latest lighting and AV systems, including pre-installed Apple TV, Sky+ HD and Lutron Homeworks. Locally-based agency Russell Simpson has been instructed.